After nearly 20 years in the business of designing kid's spaces and decor, it is not often that something makes me gasp. 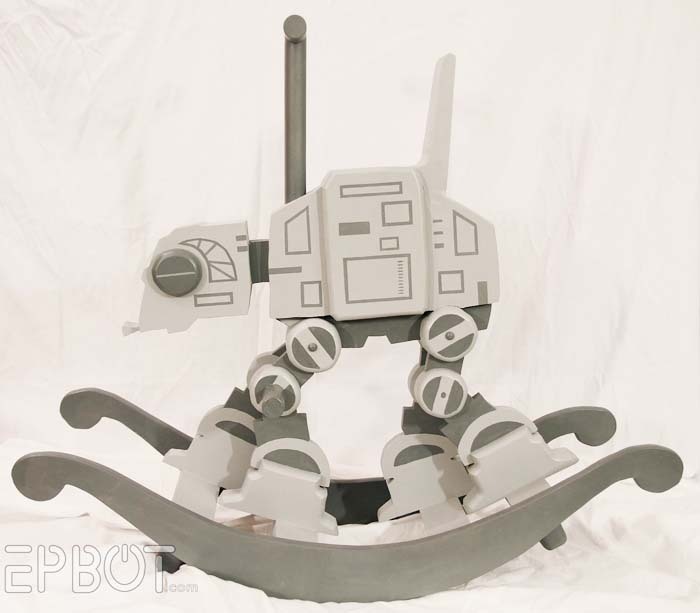 But this, hand-made AT-AT rocker created by Jen at Epbot.com, has succeeded. Jen, I love you. Readers, please jump over to her site and give her some love. Jen, may the force be with you. 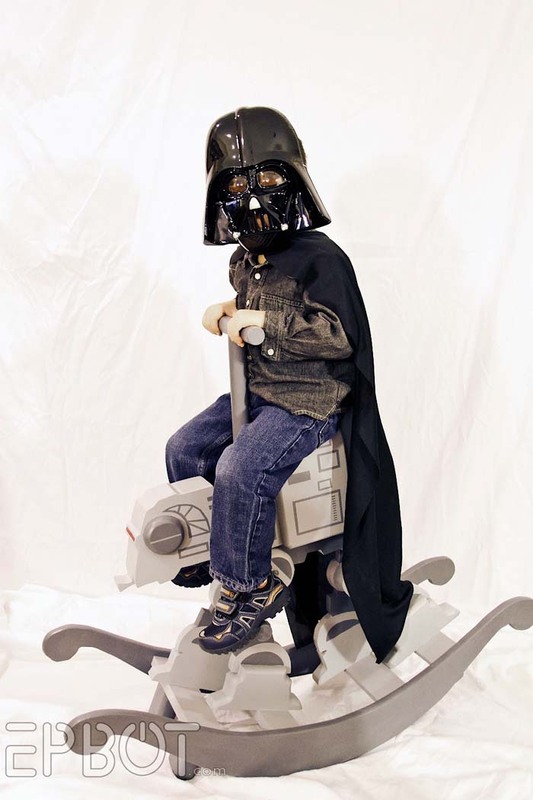 Posted in artisans, artist, bedrooms, boys, decor, decorating, DIY, girls, hand-made, inspiration, nurseries, play rooms and tagged with kids, toys, designers, girls rooms, boys rooms, kids rooms, modern, Nursery, sci-fi, Star Wars. March 3, 2014 by Ellen Mattesi. Sleeping Under a Tree. A Kids Room Fairytale. In all of the years I have designed rooms, designing a tree to cascade over a bed or crib is by far my most requested design. There is something really magical about the illusion of sleeping in the forest of a fairytale or magic garden. Breaking the boundaries of the interior by incorporating the walls and ceiling of a room is very powerful…especially when the child who sleeps under it is 3 feet tall. Posted in 3D installations, artisans, bedrooms, decor, DIY, fabrics, flowers, girls, hand-made, inspiration, kids rooms, linen, nature, nurseries, outdoors, process, trees, vintage, fantasy and tagged with tree, fairytale design, Fantasy design. August 30, 2013 by Ellen Mattesi. Twin Nurseries…Mixing it Up for Double Trouble. Chances are, with the advancements in the area of infertility, you know at least one person who has twins. Today it’s more common than ever before. And designing with this little curveball…sorry, these little curveballs, can sometimes be a challenge. Space, theme, colors, and gender…they are all factors to consider. But the incredible choices that are available now are limitless. Sometimes the way to make things work is to shake things up. Posted in bedding, bedrooms, boys, color, decor, girls, inspiration, kids rooms, murals, nurseries, process, traditional and tagged with Twins, Nurseries, Novogratz, Lulu deK. August 20, 2013 by Ellen Mattesi. On a recent trip to NYC, I visited ABC Carpet & Home. While looking through their children’s décor area, I found some beautiful pillows embroidered with a variety of illustrations of fantasy and nature. These are the work of a Brooklyn based company called Coral & Tusk. Posted in artisans, bedding, bedrooms, boys, cultural style, decor, eco friendly, fabrics, gifts, girls, hand-made, kids rooms, linen, Manhattan, nature, New York City, nurseries, outdoors, pillows, traditional and tagged with pillows, embroidery, kids rooms, nurseries, decor, artisans. August 19, 2013 by Ellen Mattesi. Pooh Nursery…My first kids room ever. In my recent posts, I’ve mentioned how it is so exciting that blogging has presented me with a “new” element in my design career. And I have received such positive feedback over these first few months. Thank you to all of you who are sticking by me while I find my voice. I’m so grateful. One question I have been asked during this time is “How did you start doing children’s rooms?” Well, THIS design is room number ONE! My very first kids room ever. Now here is the scary part. It is possible that the boy who slept in this nursery could drive right by me on the road. He might even be…dare I say…in college. Oh my god! And yet I remember this project so clearly. It was a very powerful time for me. This project took me down a path that until that point, I never even considered. Now it’s like breathing. Designing for kids allows me to experience fantasy and imagination to the extreme. I feel so privileged to have had so many parents invite me to create these whimsical spaces for their kids. I am a lucky woman. Posted in bedrooms, boys, decor, girls, kids rooms, murals, nurseries, paint, traditional, trees and tagged with Nursery, Murals, blogging. August 14, 2013 by Ellen Mattesi. The Mini Crib is in Bloom. Because my brother visited last year with his young daughter, I actually went out and bought a portable crib, car booster, and mini high chair. Oh yes, and an umbrella stroller. My husband nearly passed out. What I wish I had found was this, the Alma Mini Crib, by Bloom, www.bloombaby.com. Posted in bedrooms, boys, color, decor, girls, kids rooms, nurseries and tagged with Alma Mini Crib, crib, modern, baby, nursery. August 13, 2013 by Ellen Mattesi. This carpet, from Color Reform, is available from ABC Carpet. It is awesomely rich and vibrant. This would make a fantastic focal piece for a kid’s room. But…it’s $9000. Now don’t get discouraged. I am not suggesting that you ever spend that much on a carpet for a kid’s room no matter how much money you might have. We aren’t crazy. They’re kids! They are messy! But it would be gorgeous. So now what? Posted in cultural style, decor, girls, inspiration, kids rooms, nurseries, rugs, color and tagged with rugs, dye, kids rooms, girls, boys, decor, design, textiles. August 11, 2013 by Ellen Mattesi. Hello All. I just wanted to send a quick note to you all. I have been in bed sick for days. Stomach thing...yuck. So until I get the energy to write, here is a fun thing for you to view. I have been posting to an Anthropologie 20th Anniversary page on Pinterest. It's #anthrofave, a collection of a few Anthropologie lover's favorites. WARNING! it will make you want to shop. Keep the credit cards out of reach! Posted in bedrooms, decor, nurseries, pinterest, Anthropologie and tagged with Anthropologie, rugs. August 5, 2013 by Ellen Mattesi. Catherine, Duchess of Cambridge, and husband Prince William had a baby boy yesterday. His title will be “His Royal Highness Prince (the baby's name) of Cambridge.” It’s amazing to think I remember when Williams mother, Princess Diana, first appeared with him in her arms. Posted in bedding, boys, inspiration, nurseries, traditional and tagged with boy, nursery, Prince William, Princess Catherine. July 23, 2013 by Ellen Mattesi.